Afternoon Report: BB2 at 1000 mb formed last night and is positioned off Orissa coast. Rainfall in coastal Orissa and North A.P. Night Report: BB2 intensifies to 996 mb and moves inland and is located on East M.P. 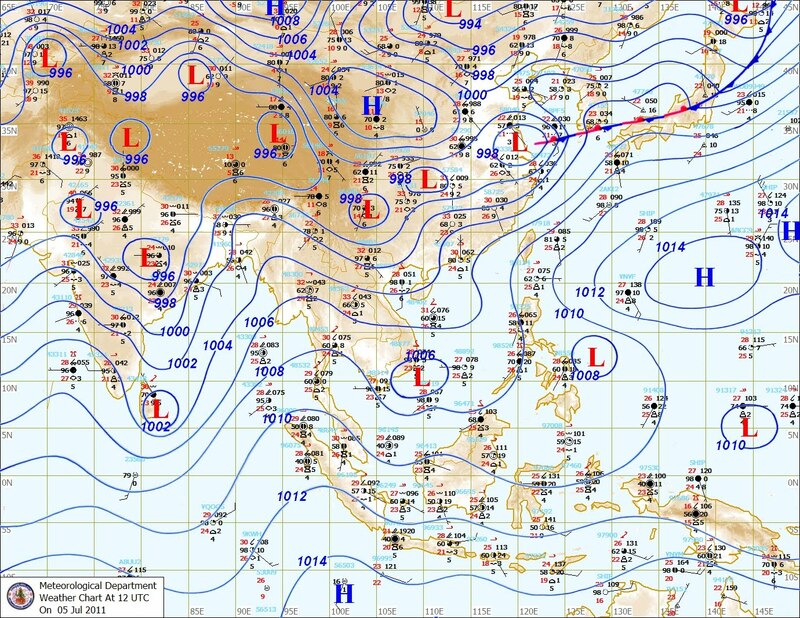 A trough runs down the eastern coast of India. By evening, we see clouding massed in the western quadrant of BB2. This is a result of strong westerly inflow of moist air towards the system from the Arabian Sea. Precipitation reported from M.P, Vidharbha, North Mah. and Eastern parts of Gujarat. By evening, thunderclouds were seen along the Mah. western ghats. This "speedster" system is expected to remain around West M.P. region, without deepening further, and then fade away before Friday. Its seems like a a short stint. Good precipitation could be expected in Eastern Gujarat and Western M.P. on Wednesday. Gujarat regions of Baroda, Bharuch and Surat may get heavy rain. But penetration into Saurashtra peninsula will be weak, as the system would have faded off by then. Inflow towards the system will be via the North Konkan route. Hence, i would vouch for some heavy showers and thundershowers in North Konkan belt on Wednesday/Thursday. After a 20 mm rainfall day on Monday, Tuesdat was drier for Mumbai, with only 5 mms recorded till 8.30 pm. 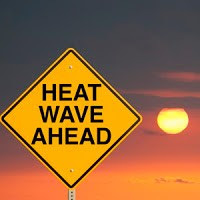 In the Sunday write-up, Vagaries had predicted an increase in showers for Mumbai from Wednesday into Thursday, but with a caution that we would monitor the development of the situation. Well, I think a gradual increase of rainfall from Wednesday is possible, and with thunder, Mumbai can have frequent heavy showers thru an overcast Thursday. Rain amounts of 25-30 mms on Wednesday and 30-35 mms on Thursday. Thanks Rajesh, yes i concur with you that this time again rains will give Pune a miss. The situation is quiet acute here with just 13 % of kharif sowing complete. Drought looms large . 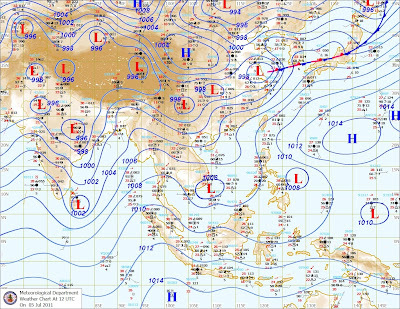 Rajesh, the Thai Map of today morning does not show the LOW at E-MP at all, instead it shows a 1000 mb LOW off the Andhra Coast. Isn't this a bit strange? Also, the 12z runs of NGP, GFS and UKMET show no LOW at all. The LOW that you have mentioned in your blog of yesterday night seems to have just vanished!! Yes, in Baroda, the sky is fully overcast, hope it would rain. its raining in borivali from 9.15 am (today 6th july). now at 11.41am the rain is light. at 11.10am i heard light thunder!! ...... good prediction!! it has starting raining heavily from 10:30 am onwrds at panvel.nd now the rain rate has increased in between strong sounds of thundr is also heard,,,,luks like we ll be topping in mum region today,,,,,, recently wen the large heighted thundrcell developd over mumbai area on 28 june panvel was the topper in konkan goa wid 7 cm of rainfall,,,,,,very happy to see the wet spell back!!!!!!!!!! @Rajesh Its been raining lightly with occasional thunder in dadar for last 1 hour. Dark cloulds are gathering from southwest. Should start raining relatively heavily withing next hour. But when will we get typical july heavy rains when it rains almost 150 ml on some days. It doesnt look like there will any strong low/depression in bay in next 10 days.